[2012 Oct] U.S Military Plans to Prevent Veteran Suicides by Taking Away their Guns This fact has been so unsettling for many people in the mainstream because it exposes the true nature of what war is all about. When the people on the front lines are so depressed about what they have seen and what they have been forced to do, it opens up a whole list of questions that people in the US have been running from for over a decade. As of last month, 270 active-duty service members killed themselves this year alone, and half were from the Army. [vid] More soldiers lost to suicide than battle. The #1 censored story of 2011 More U.S. Soldiers Killed Themselves Than Died in Combat in 2010. For the second year in a row, more American soldiers—both enlisted men and women and veterans—committed suicide than were killed in the wars in Iraq and Afghanistan. Excluding accidents and illness, 462 soldiers died in combat, while 468 committed suicide. A difference of six isn't vast by any means, but the symbolism is significant and troubling. 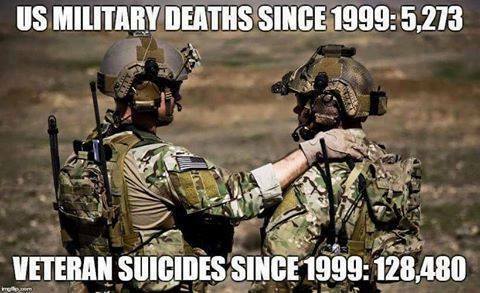 In 2009, there were 381 suicides by military personnel, a number that also exceeded the number of combat deaths. Earlier this month, military authorities announced that suicides amongst active-duty soldiers had slowed in 2010, while suicides amongst reservists and people in the National Guard had increased. 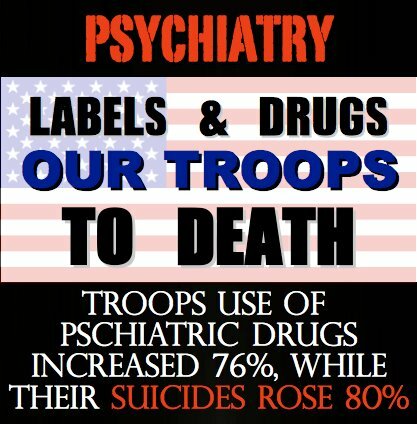 It was proof, they said, that the frequent psychological screenings active-duty personnel receive were working, and that reservists and guardsmen, who are more removed from the military's medical bureaucracy, simply need to begin undergoing more health checks. This new data, that American soldiers are now more dangerous to themselves than the insurgents, flies right in the face of any suggestion that things are "working." Even if something's working, the system is still very, very broken. One of the problems hindering the military's attempt to address soldier suicides is that there's no real rhyme or reason to what kind of soldier is killing himself. While many suicide victims are indeed afflicted with Post Traumatic Stress Disorder after facing heavy combat in the Middle East, many more have never even been deployed. Of the 112 guardsmen who committed suicide last year, more than half had never even left American soil.